Snowflakes are a very popular motif in northern Europe, where the snow falls for much of the winter and there is snow high in the mountains year round. Inspired by the knitting traditions in Norway, this intricate pattern will bring a little Norwegian style into your home. 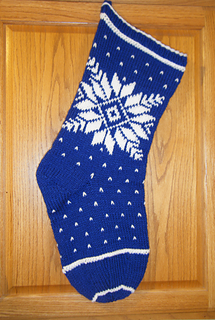 This Christmas stocking features one of the elaborate snowflake patterns. Knit from the top down, a two-color cast on and bands of Double Purl Stitch accent the top and toe. 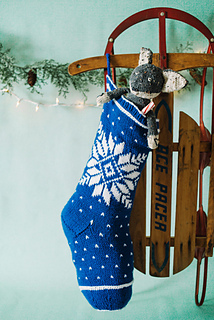 For a smaller stocking use a finer yarn and needle to match the yarn.